Lighthouse Technologies Limited (Lighthouse), a LED video display solutions specialist has joined forces with Macroblock to launch the new Quantum q fine pitch LED Screen Series (1.5mm, 1.8mm & 2.5mm pixel pitch) using the Macroblock’s 48-Ch LED Driver IC MBI5353 to deliver the unprecedented LED fine pitch display screen at ISE 2018. This cooperation comes at a time when changes within the LED Driver IC industry such as long operation hours and high power consumption & surface temperature of LED video display have made it increasingly difficult for companies to pursue technological innovations. Macroblock improved LED Driver IC’s performance efficiency featured with “Intelligent Power Saving Mode – Dynamic” (Model MBI5353) which reduces power consumption tremendously up to 50% when showing all black images or during stand-by mode and at the same time lower the surface temperature up to 5°C of the LED video display. 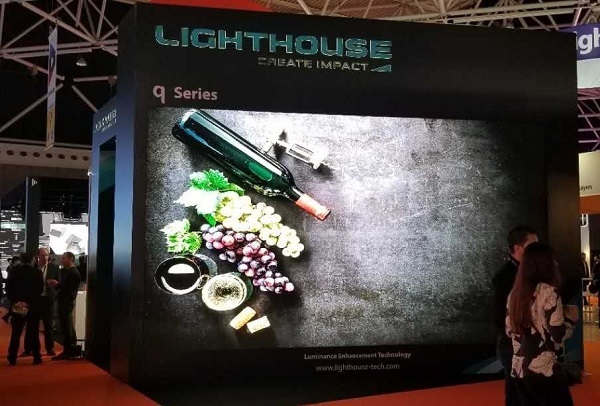 “As a leading LED video display specialist like Lighthouse, we want to use new innovative components in our products to demonstrate our R&D efforts. We are convinced that developing the new Quantum q fine pitch LED Screen Series using Macroblock’s MBI5353 driver IC is the right path for us and it will definitely help us to establish a strong business for the new technology,” says Peter Chan, Lighthouse Managing Director. Macroblock’s General Manager, Robert Chen commented, “The application of MBI5353 LED Driver IC into Lighthouse’s fine pitch LED display has made it possible for us to implement such a challenging project. That is what we are very pleased to see the satisfactorily performance of the collaborative work together with Lighthouse’s engineering team. Lighthouse & Macroblock also anticipated their cooperation for next generation of Mini-LED (0.75mm pixel pitch) and Micro-LED development. The advantages of Micro-LED display are dramatic. It brings higher efficiency & reliability, wider viewing angle, moire-free comparing to SMD LED or COB LED display. Macroblock will have the latest design Mini-LED demo display at coming ISE 2018 (Booth no. Hall 8-C430). Please stop by at Macroblock’s booth for further product details.